We motivate educators to use the arts in the classroom by demonstrating the connections between the most recent brain research, multiple intelligences theory, revised Bloom’s Taxonomy, Common Core and State Standards, and arts integration. We inspire teachers to embrace the arts as the powerful teaching tools they are by engaging teachers in arts-integrated learning. We enable teachers to teach with the arts immediately by providing practical tools and demonstrating arts-integrated lessons. We tailor professional development programs for teachers and staff to fit their needs by working in partnership with school and district administrators, school leadership teams, and educational organizations. We join forces with arts organizations to teach artists to uncover authentic connections between their art and curricular goals while creating residency plans that organically integrate arts and curricular objectives. 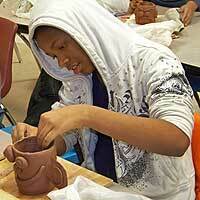 We focus on curriculum because arts residencies that incorporate the curriculum are attractive to teachers.